Picketing Adecco – solidarity with the CNT! On Friday 24th February members of York Anarchists and others took part in a picket of Adecco (leaflet here) in solidarity with members of the CNT in Cordoba, Spain. This picket was part of a series of pickets held across the UK organised by the Solidarity Federation. Workers at a Asea Boveri Brown (ABB) factory in Cordoba Spain have been on indefinite strike since 28th November, camped out all day and night in front of the factory. The strike was called in protest at ABB plans to make workers employed by subcontractors EULEN at the factory redundant and replace them with EUROCEN non-union labour with no experience or qualifications. EUROCEN is the logistics division of the ADECCO Group of companies. Their union the National Conferation of Labour (CNT) points out that the problems related to the work in ABB are also related to outsourcing in general. The workers who were employed through EULEN in fact worked for ABB and took orders from them, but they have a much lower salary and worse working conditions than regular ABB workers and ABB took no responsibility for them as an employer. There were serious breaches of health and safety and inadequate equipment provided. There is also the fact that the relevant collective agreements for the work they actually perform were not applied. Management’s refusal to address these issues also led to the strike. First management responded by hiring scab labour from ADECCO. Then they fired all the strikers. By continuing to provide strikebreakers, ADECCO is complicit in ABB’s continued union repression at the factory where there have been a number of union victories over the last 2 years. Employment agencies like Adecco have been complicit in undermining workers, driving down wages and break strikes across the world. The very nature of temp work divides workers and weakens their resistance – by creating a division between permanent and agency staff, by ensuring a steady supply of labour to break strikes and replace redundancies, and by putting workers in an unstable, precarious position, making it increasingly difficult to organise against attacks on our pay and conditions. The fight of the CNT workers in Spain is part of a much wider, and ongoing, fight against the use of casual labour to undermine the entire working class. A group of anarchist radicals living and working in the city of York. This entry was posted in pickets, protests, solidarity, workplace resistance. Bookmark the permalink. 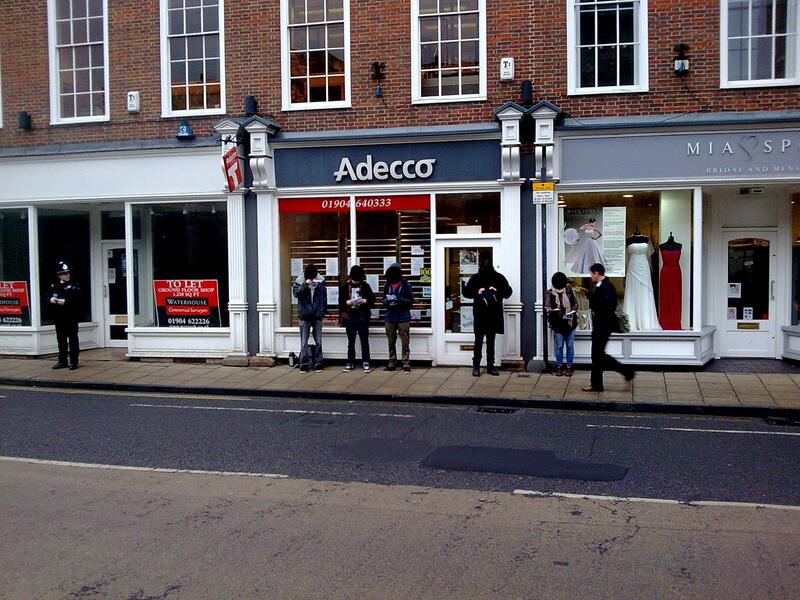 3 Responses to Picketing Adecco – solidarity with the CNT! I am not certain exactly where you’r gttngour infmation, but great topic.I mut spend a whle finding ut much more ο undstanding moe.Thanκ you for magnificent info I ued to become around the lookout fo this nformation for m mission. I’m not certain exactly why but this web website is loading extremely slow for me. Is anyone else having this issue or is it a issue on my end? I will verify back later on and see if the problem still exists.